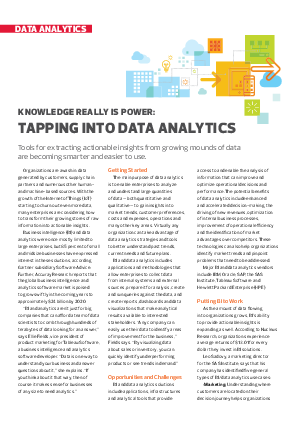 Tools for extracting actionable insights from growing mounds of data are becoming smarter and easier to use. Organizations are awash in data generated by customers, supply chain partners and numerous other humanand machine-based sources. With the growth of the Internet of Things (IoT) starting to churn out even more data, many enterprises are considering how to transform their growing stores of raw information into actionable insights. Gartner subsidiary Software Advice. Further, Accuray Research reports that the global business intelligence and analytics software market is poised to grow swiftly in the coming years to approximately $24 billion by 2020.